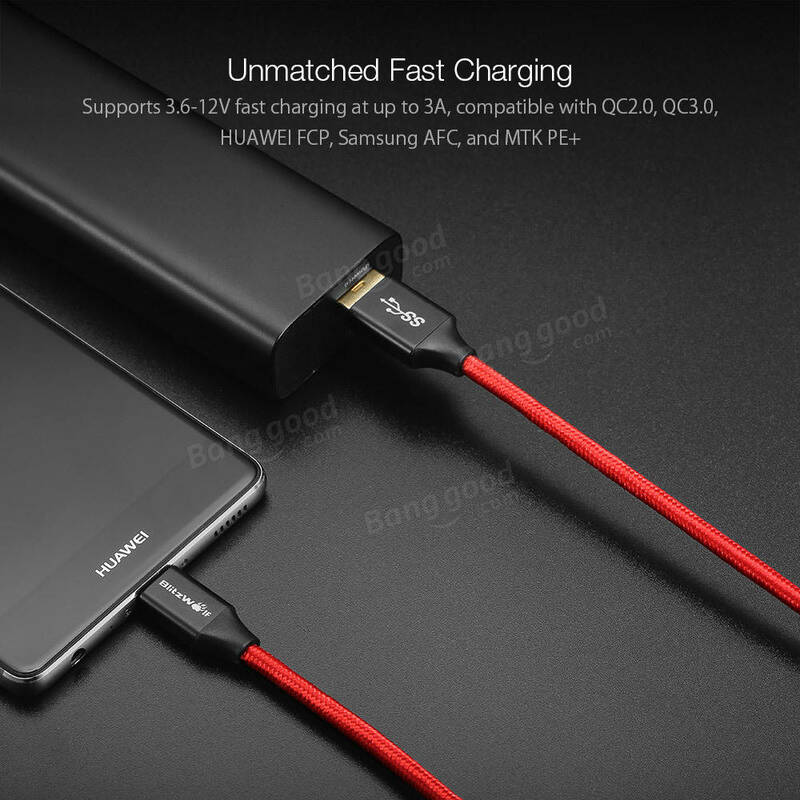 For just US$6.59 , buy BlitzWolf® AmpCore Turbo BW-TC10 3A Braided Durable USB 3.0 to Type-C Charging Data Cable 6ft/1.8m from the China wholesale webshop. AmpCore Turbo: The only cable you&apos;ll ever need. We took the unbreakable power of Ampcore and turbocharged it with USB 3.0. Now, with AmpCore Turbo, you get mighty strength, blazing data speed and gold tipped connectors. Fast USB 3.0 Type C: Enjoy data transfer speeds of up to 5Gbps, more than 10 times faster than USB 2.0. cables. Internal Resistor: Type C cables without an internal resistor can overheat or damage your device. Ampcore Type C cables have a built-in 56kΩ resistor that provides smooth and safe charging. -Gold-plated reversible connector heads won&apos;t corrode over time and provide unrivaled long term conductivity. -Flexible and strong braided wire sheath can be bent over 5000 times with no change in performance. -Engineered with 22AWG power and 32AWG data tinned copper wire cores for fast charging and data transfer. Fast Charging: Supports 3.6-12V fast charging at up to 3A, and is compatible with Qualcomm QC2.0, QC3.0, MTK Pump Express Plus and most other fast charging technologies. High Compatability: Compatible with most Type-C digital devices such as smart phones, tablets, MP3 players, digital cameras, camcorders, hard drives, e-readers, power banks and portable game players.